When we made our Begonia libraries, working with (in some cases) relatively small quantities of very degraded DNA, we should have diluted the adaptors. We didn’t. Consequently, we ended up with huge adaptor peaks in some of our libraries. Meanwhile the clock was ticking and we really needed to get the lab-work finished and the samples sent off for sequencing. The obvious thing to do was a bead-clean to try to remove as much of the c. 150 base adaptor peaks, while leaving as much of the actual libraries, as possible. So, what bead-to-sample ratio would be best….? A 5 ml aliquot of beads was removed from the fridge about half an hour beforehand, to come to room temperature, and thoroughly vortexed before use to resuspend the beads. The beads were mixed with the sample (i.e. 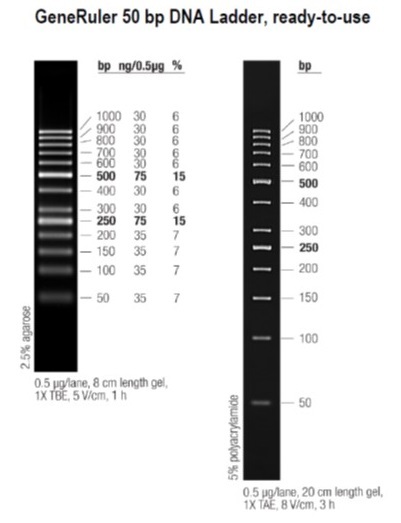 the ladder) in 1.5 ml eppendorf tubes, by pipetting slowly up and down a few times; the mixture was left for 5 minutes at room temperature, then 5-8 minutes on a magnetic rack for the beads to form a pellet; the supernatant was discarded. The beads were washed twice with 200 µl of 80% ethanol, then air dried for up to 5 minutes, removed from the rack and resuspended in 30 µl 0.1x TE to elute the DNA into the buffer. The samples were left for two minutes, then placed back on the magnetic rack for 2-5 minutes. The supernatant was removed, and 2 µl of each sample was run on a Tapestation on an Agilent High Sensitivity D1000 ScreenTape. 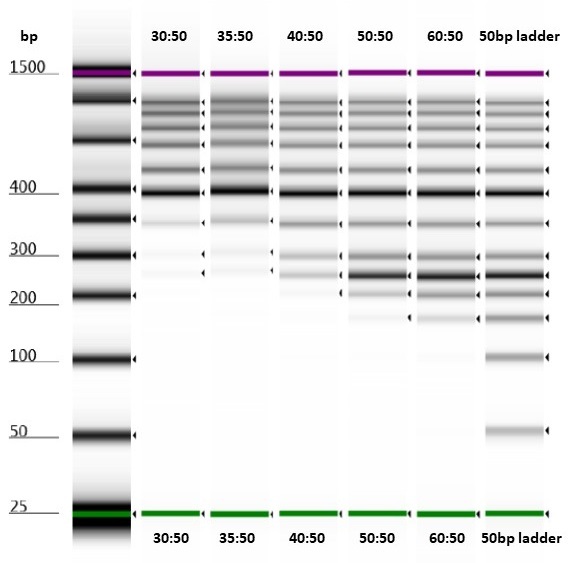 Test of varying bead-to-sample ratios on a Thermo Scientific™ GeneRuler™ 50 bp DNA Ladder run on an Agilent High Sensitivity D1000 ScreenTape. All the bead-to-sample ratios that we tried successfully removed short fragments (around the size of the adaptor peaks) from our samples. However, it seemed that approximately equal volumes of bead-to-sample would remove less of the library-sized DNA fragments. 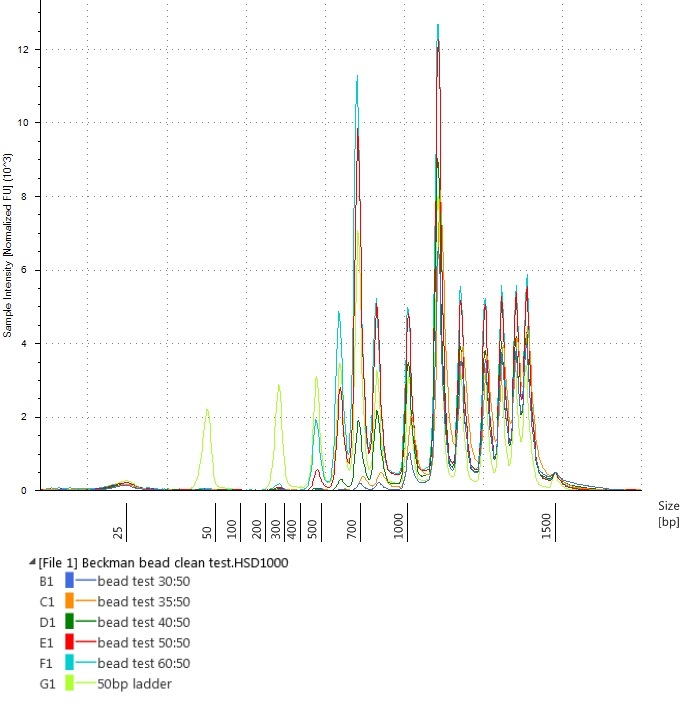 As such, it was a useful test, and allowed us to go on to test the bead cleans on a surplus pool of hybridised libraries, just to make sure that we had the ratios right, before cleaning the adaptors out of our sequencing pools. 1232 bp (for the 1000 bp band).